The in-the-money call options are highlighted by the yellow field in the bid column on the left side of the screenshot while the in-the-money put options are highlighted by the purple field in the bid column on the right side of the screenshot. Exercise by exception is an administrative procedure used by OCC to expedite the exercise of expiring options by clearing members. The OCC exercises options that are in-the-money by specified threshold amounts (usually ($0.01 or more in-the-money) unless the clearing member submits instructions not to exercise these options. Exercise by exception is a procedural convenience extended to OCC clearing members, which relieves them of the inconvenience of entering individual exercise instructions for every option contract. This procedure is not intended to prevent customers from communicating exercise instructions to their brokers. Exercise by exception is the price of the regular-hours trade reported last to the OCC at or before 4:01:30 pm ET on the day before expiration. This trade will have occurred during normal trading hours, i.e., before 4:00 pm. It can be any size and come from any participating exchange. The OCC reports this price tentatively at 4:15 pm, but, to allow time for exchanges to correct errors the OCC does not make the price official until 5:30 pm. Individuals sometimes incorrectly refer to the exercise by exception procedure for expiring options as automatic exercise. The distinction is that exercise by exception always allows an OCC clearing member to make a choice not to exercise an option that is in-the-money by the exercise threshold amount or more. The exercise threshold amounts used in exercise by exception triggers automatic exercise only in the absence of contrary instructions from the clearing member. Because the right of choice is always involved in exercise by exception, exercise under these procedures is not necessarily automatic. ***It is important for us the know the exercise threshold used by our brokers and to communicate any specific instructions we may want outside these threshold specifications. Most options traders don’t exercise options in order to take profit. According to the OCC, for the year of 2008, 69.4% of all options were closed out before they expire. This means that 69.4% of options traders simply sell their options in order to take profit or cut loss. Only 11.6% of all options contracts were exercised with only 19% of all options contracts expiring worthless. Of course this statistic totally busted the myth that more than 80% of all options contracts expire worthless.Investors should consult with their broker concerning their brokerage firm’s exercise policy i.e. what is the firm’s automatic exercise policy and the firms deadline to submit exercise instructions? Exercise of our options is a procedure we can control almost 100% of the time. If we bought an option, we can instruct our broker not to exercise at the threshold amount. If we sold an option, we can buy it back prior to expiration. I have also written extensively as how to avoid early exercise. For the week, the S&P 500 declined by 0.67% for a year-to-date return of +5.37%. BCI: My positions for the October contracts favor in-the-money strikes 2-to-1. I’m leaning slightly defensive because of the upcoming election and Fed watch. The charts point to a neutral to slightly bullish outlook. In the past six months the S&P 500 rose by 5% while the VIX declined by 17%. Last week you wrote about poor mans covered call a strategy I am interested in with my limited resources. My question is how it works if the short call is exercised. What happens to the LEAP? Generally, once the short call is exercised your broker will automatically exercise the long call to provide the shares for the short call obligation. I would double check with your broker regarding the actual specifics. As a side note, if you keep some cash on the sideline, you may be able to just buy back the option and then decide what you do from there. If a stock is declining in the last contract week from market sentiment, then is it still a good idea to do a rolldown if the commission costs (of the BTC & STO trades) are larger than the trade credits received? – Also do the option values always move up/down every minute in conjunction with the stock prices? 1- I would roll down only to create a net credit. In the final week of the contract there is little opportunity to take advantage of time value to mitigate positions. Closing both legs of the trade is also available to us if the stock is under-performing the overall market. 2- Yes, option premiums move in conjunction with stock price (Delta). Also, volatility (Vega) and time value erosion (Theta) play roles. Option values change frequently during the course of a trading day. This week’s Weekly Stock Screen And Watch List has been uploaded to The Blue Collar Investor Premium Member site and is available for download in the “Reports” section. Look for the report dated 10/07/16. 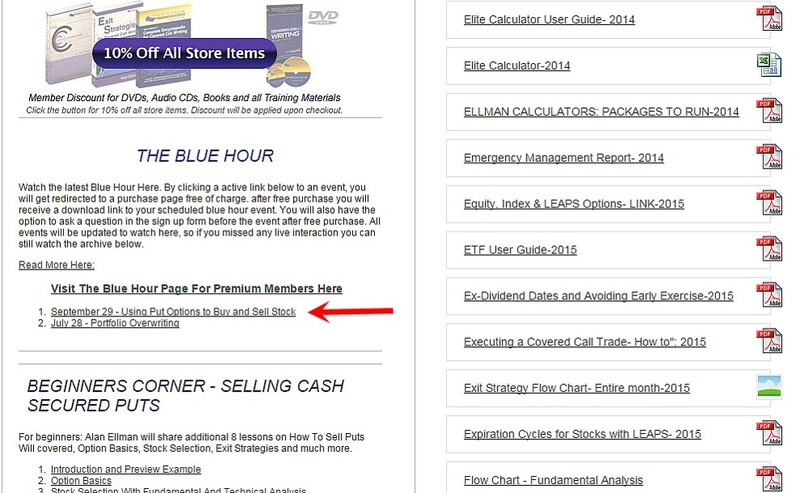 Our most recent webinar “Using Put Options to Buy and Sell Stock” is now available on the premium site. To access this recording login to the member site and scroll down below the 10% discount link on the left side as shown below. As a follow up, the way I read Alan’s post about the elections and politics last blog he was reminding us it is more constructive to discuss money than politics. I agree. So the nuttier and more embarrassing to explain to our children this cycle gets, and it got more so since Alan posted, the more refuge I take in being a Capitalist first! F. Scott Fitzgerald wrote the test of a first rate intelligence is the ability to hold two opposed ideas in the mind and still function. as Alan says, let’s talk money. After yesterday’s political debacle, it seems to me the election will be a non event for the stock market this time. Therefore I am planning to stay fully invested, and follow Alan´s prudent 2-to-1 in the money approach for the October contracts. Unless something spectacular happens, the FED’s rate policy will probably dominate the market news, and earnings will eventually dictate the mood for November and December. The market is a better prognosticator than me. Going back to the beginning of records if the market is up in the months going into a Presidential election the incumbent party wins 85% of the time. I do not understand your explanation. Apologies for my lack of specificity! In my hobby reading about the market and elections I have seen several studies that suggest if the S&P is up in the 3 months leading up to a US Presidential election the incumbent party wins about 85% of the time. Interestingly I saw no statistics about if it is down. One would assume the incumbent party lost most of those. Let’s talk 2016: If you back up 3 months from the Nov 8th election the S&P closed at 2182.87 on Aug 8th. We are trading at 2141 as I write this. A less than 2% difference. Certainly no up trend but hardly a collapse. We have gone side ways. Thanks for the explanation Jay, now I understand it. My difficulty is because I am a Brazilian, and my English is sometimes faulty, Especially when expressions like “incumbent” for example, which are quite ordinary to you, are unknown to me. So I look it up in “Google translator”, and “synonims”, and finally I end up deducting that incumbent means the party in power. Please never give up on me. I was wondering how Allan allocates his portfolio. 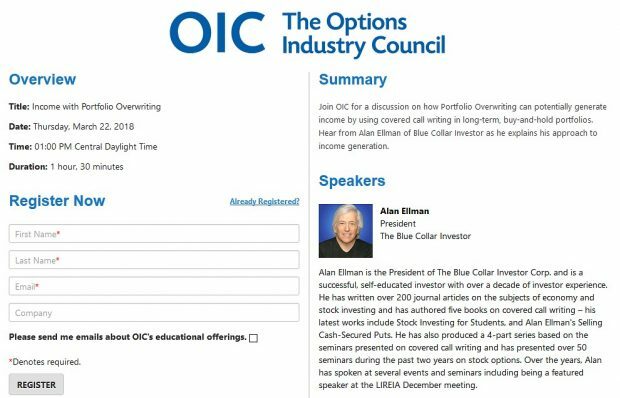 Does he have a core portfolio of blue chips and write monthly covered calls based on the weekly results on a portion of his overall portfolio, or have most of his portfolio based on the weekly charts? I use our Premium Stock Reports exclusively for my covered call writing portfolios. I use the ETF reports for my mother’s portfolio. I use the same watch lists available to our premium members, nothing more. 1. So what I mean is for the stocks that I am trading off the premium report then do I need to constantly check them for if I need to readjust my view on them if wanting to do an exit strategy? Like keep checking the Industry rank, R/R & beta values,- and if Industry rank & R/R drops(or beta increases when in a volatile market), then shouldn’t I maybe be more cautious on my exit strategies? (for instance:- roll-down ITM, instead of ATM, etc…)? 3. And also when you try to outperform the S&P500 then are you hoping your monthly return each month is greater than the markets return, or that your overall yearly return is greater,- as there is a difference? I will try also to remember from your previous answers to not bother so much for roll-downs in last contract week. That would leave me to either take no-action and hope for no further loss, or to close-out any showing some underperformance. Thanks for the great answers you always give out. 1- Great question frequently asked by new members. Once a position is entered, it is managed as per our exit strategy arsenal detailed in my books and DVDs. We recently added a note in the key on page 2 of the stock reports to this effect as shown below. If a position is closed, we use the most recent report for replacement stocks. 3- There may be a few aberrations but assuming we have mastered the 3 required skills (stock selection, option selection and position management), we should routinely out-perform the S&P 500.